Good Day guys, I'm back with some guides on another feature present inside CABAL Online. Common for some MMORPGs, we always read about other players if ever a game has a craft system or how can we rate the crafting system on the online games that we play. Crafting in CABAL Online has a level requirement of 50. When you reach that level you're going to have a quest on an NPC on Port Lux which will give you an access on the Crafting window when you press "F". This is the Crafting or Production window shown below, once you receive a Craftsman Token from NPC Chloe you can now add items that you want to craft. 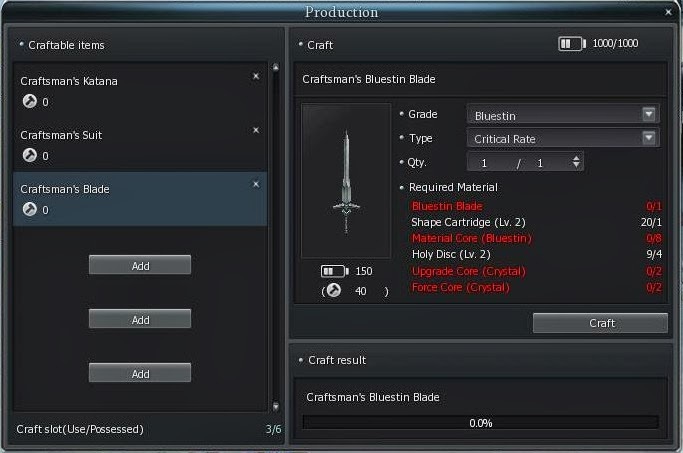 As an example I chose to craft a Craftsman's Bluestin Blade. - Type of weapon or armor, you can choose starting at Bluestin all the way up to Forcium grade. - How many do you like to make. - Items needed to craft the chosen weapon or armor. Note: Hover your mouse on the Bluestin Blade or on the first required material in order to know what do you need to look for. 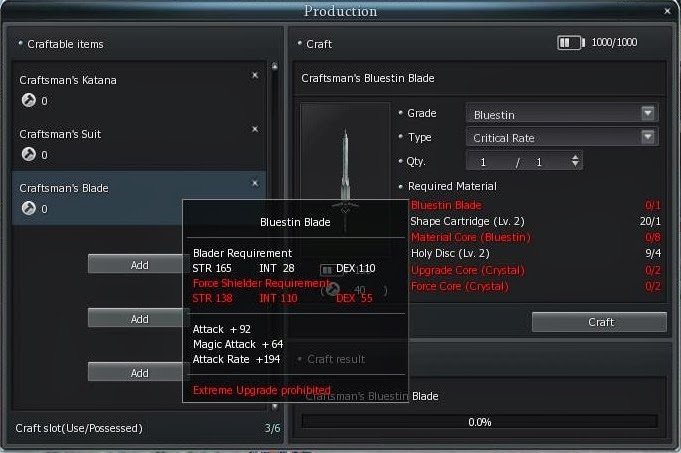 Sometimes an item requires to have 1 or 2 weapon slot for it to be qualified as your material for crafting. Then if you have completed all the materials needed, just click the Craft button and wait for the result. Reminder: Every time you craft there's a required energy for it so when you max out all of your energy you can't craft anymore but energy will be refilled on a certain time interval. See the Battery like figure on top of the Crafting screen, the one with 1000/1000 on it. This information is also a heads-up for new CABAL Online players that wants to craft items on their own. You can save up materials and create gears for you or for profit. Let's discuss more about the game, please leave a comment below. can i max my crafting point by just crafting bulestin? or is there a limit point given, like amity, which you have to craft titanium to get higher crafting point?